ALLEGRA BOVERMAN/Staff photo. Gloucester Daily Times. 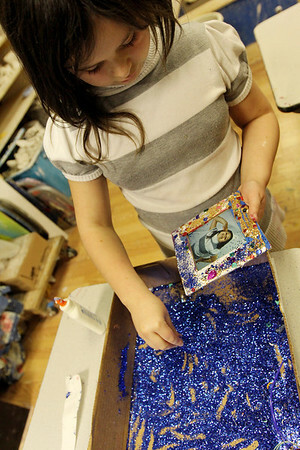 Gloucester: Kaylee Allen, 8 1/2, sprinkles bright blue glitter on a picture frame she created at Art Haven's "Picture Perfect" winter workshop on Monday afternoon. The center has several more workshops planned this week, including a wrapping paper (design your own wrapping paper design) project workshop on Wed., Dec. 21, reindeer games (board game making workshop) on Thurs., Dec. 22, and a Christmas Collaboration on Fri., Dec. 23, where participants will work together to make a large piece of art. All workshops are from 3:30 - 5:30 p.m. Call Art Haven to reserve a spot at 978-283-3888.